This category is intended to list persons buried in Westminster Abbey and who are included in Westminster Abbey Burials and Memorials. Wikimedia Commons has media related to People buried in Westminster Abbey. Pages in category "Burials at Westminster Abbey"
The following 200 pages are in this category, out of approximately 292 total. This list may not reflect recent changes (learn more). Anne of Denmark was Queen consort of Scotland and Ireland as the wife of King James VI and I. The second daughter of King Frederick II of Denmark, Anne married James in 1589 at age 15, Anne appears to have loved James at first, but the couple gradually drifted and eventually lived apart, though mutual respect and a degree of affection survived. In England, Anne shifted her energies from factional politics to patronage of the arts and constructed her own magnificent court, after 1612, she suffered sustained bouts of ill health and gradually withdrew from the centre of court life. 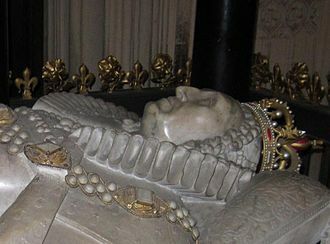 Though she was reported to have been a Protestant at the time of her death, historians have traditionally dismissed Anne as a lightweight queen and self-indulgent. However, recent reappraisals acknowledge Annes assertive independence and, in particular, Anne was born on 12 December 1574 at the castle of Skanderborg on the Jutland Peninsula in the Kingdom of Denmark. Her birth came as a blow to her father, King Frederick II of Denmark, but her mother, Sophie of Mecklenburg-Güstrow, was only 17, three years she did bear Frederick a son, the future Christian IV of Denmark. With her older sister, Anne was sent to be raised at Güstrow in Germany by her maternal grandparents, the Duke and Duchess of Mecklenburg. Christian was sent to be brought up at Güstrow but two later, in 1579, the Rigsraad successfully requested his removal to Denmark, and Anne. Anne enjoyed a close, happy family upbringing in Denmark, thanks largely to Queen Sophie, James other serious possibility, though 8 years his senior, was Catherine, sister of the Huguenot King Henry III of Navarre, who was favoured by Elizabeth I of England. The constitutional position of Sophie, Annes mother, became difficult after Fredericks death in 1588, when she found herself in a power struggle with the Rigsraad for control of King Christian. As a matchmaker, Sophie proved more diligent than Frederick and, overcoming sticking points on the amount of the dowry, Anne herself seems to have been thrilled with the match. Whatever the truth of the rumours, James required a match to preserve the Stuart line. On 20 August 1589, Anne was married by proxy to James at Kronborg Castle, Anne set sail for Scotland within 10 days, but her fleet was beset by a series of misadventures. 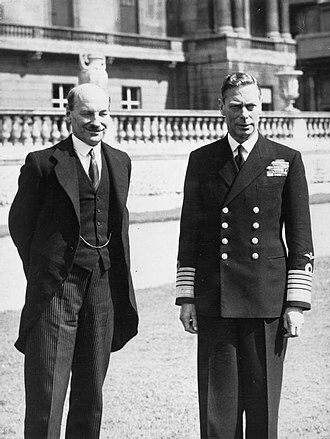 Blake is recognised as the chief founder of Englands naval supremacy, a dominance subsequently inherited by the British Royal Navy into the early 20th century. Despite this, due to attempts to expunge the Parliamentarians from history following the Restoration. Blake was one of thirteen born to a merchant in Bridgwater, Somerset. After attending Wadham College, Oxford, he had hoped to follow an academic career, after his departure from university in 1625, it is believed that Blake was engaged in trade, and a Dutch writer subsequently claimed that he had lived for five of six years in Schiedam. Having returned to Bridgwater, probably because of the death of his mother in 1638, in 1640 Blake was elected as the Member of Parliament for Bridgwater in the Short Parliament. He would return to recover from a sustained in the Battle of Portland. After joining the New Model Army as a captain in Alexander Pophams regiment, after his leading role in holding Lyme Regis in the Siege of Lyme Regis he was promoted to colonel. He subsequently succeeded in winning the Siege of Dunster, Blake was appointed general at sea in 1649. In 1651 he led a force to remove the Royalist Sir John Grenville from the Scilly Isles. Blake is often referred to as the Father of the Royal Navy, in 1656, the year before his death, Blake was appointed Lord Warden of the Cinque Ports. Blake blockaded Ruperts fleet in Kinsale from 22 May, allowing Oliver Cromwell to land at Dublin on 15 August, Blake was driven off by a storm in October and Rupert escaped via Spain to Lisbon, where he had expanded his fleet to 13 ships. Blake put to sea with 12 ships in February 1650 and dropped anchor off Lisbon in an attempt to persuade the Portuguese king to expel Rupert, after two months the king decided to back Rupert. 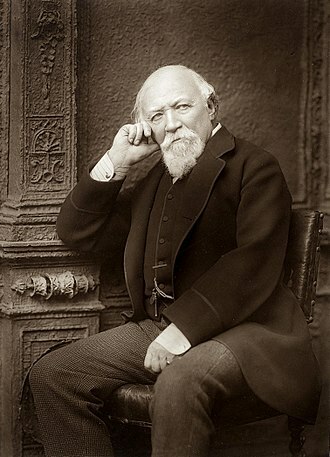 Blake was joined by four warships commanded by Edward Popham. Parliament voted Blake 1,000 pounds by way of thanks in February 1651, in June of the same year Blake captured the Isles of Scilly, the last outpost of the Royalist navy, for which he again received Parliaments thanks. Edward George Earle Lytton Bulwer-Lytton, 1st Baron Lytton PC, was an English novelist, poet and politician. He was immensely popular with the public and wrote a stream of bestselling novels which earned him a considerable fortune. He coined the phrases the great unwashed, pursuit of the almighty dollar, the pen is mightier than the sword, dweller on the threshold, and he had two elder brothers, William Earle Lytton Bulwer and Henry, Lord Dalling and Bulwer. When Edward was four his father died and his moved to London. 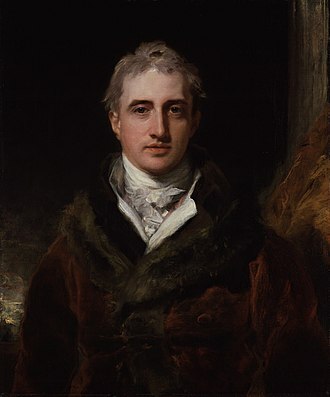 He was a delicate, neurotic child and was discontented at a number of boarding schools, but he was precocious and Mr Wallington at Baling encouraged him to publish, at the age of fifteen, an immature work and Other Poems. 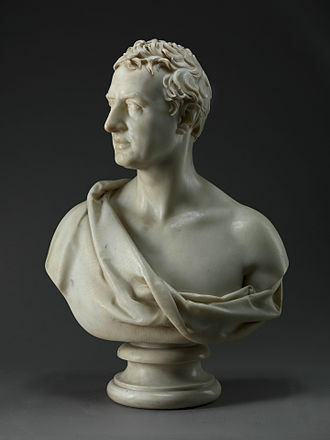 In 1822 he entered Trinity College, where he met John Auldjo, in 1825 he won the Chancellors Gold Medal for English verse. In the following year he took his B. A. degree and printed, for private circulation and he purchased a commission in the army, but sold it without serving. In August 1827, against his mothers wishes, he married Rosina Doyle Wheeler, when they married his mother withdrew his allowance and he was forced to work for a living. They had two children, Lady Emily Elizabeth Bulwer-Lytton, and Robert Lytton Bulwer-Lytton, 1st Earl of Lytton who became Governor-General and his writing and political work strained their marriage while his infidelity embittered Rosina, in 1833 they separated acrimoniously and in 1836 the separation became legal. Three years later, Rosina published Cheveley, or the Man of Honour, in June 1858, when her husband was standing as parliamentary candidate for Hertfordshire, she indignantly denounced him at the hustings. He retaliated by threatening her publishers, withholding her allowance, finally he had her committed to a mental asylum. But, after a public outcry she was released a few weeks and this incident was chronicled in her memoir, A Blighted Life. For years she continued her attacks upon her husband’s character, the death of Bulwer-Lyttons mother in 1843 greatly saddened him. Louis Antoine Philippe dOrléans, Duke of Montpensier was a son of Louis Philippe, Duke of Orléans, and his duchess Louise Marie Adélaïde de Bourbon, Duchess of Orléans. He was the brother of Louis Philippe, King of the French. Antoine had an affection for him, and they were only ever separated during the Reign of Terror. In Paris at the time of the trial of Louis XVI, in April 1793, whilst adjutant-general in the armée du Var, Antoine Philippe was arrested at the same time as the other Bourbons who had remained in France. He was imprisoned in Fort Saint-Jean at Marseille, during his imprisonment, Antoine Philippe contracted the tuberculosis that eventually killed him. He set out on 5 November 1796, accompanied by his brother Louis Charles, comte de Beaujolais, for two years they travelled around New England, in the Great Lakes and Mississippi area. Returning to Europe in 1800, the royal House of Bourbon was still in exile from France, despite her noble lineage, authorisation for the marriage was withheld by Louis, Count of Provence, and the couple never wed.
Aphra Behn was a British playwright, poet and fiction writer from the Restoration era. As one of the first English women to earn her living by her writing, she broke cultural barriers, rising from obscurity, she came to the notice of Charles II, who employed her as a spy in Antwerp. Upon her return to London and a brief stay in debtors prison. She belonged to a coterie of poets and famous libertines such as John Wilmot and she wrote under the pastoral pseudonym Astrea. A staunch supporter of the Stuart line, she declined an invitation from Bishop Burnet to write a poem to the new king William III. Her grave is not included in the Poets Corner but lies in the East Cloister near the steps to the church, information regarding Behns life is scant, especially regarding her early years. This may be due to intentional obscuring on Behns part, one version of Behns life tells that she was born to a barber named John Amis and his wife Amy. Another story has Behn born to a couple named Cooper, the Histories And Novels of the Late Ingenious Mrs.
Behn states that Behn was born to Bartholomew Johnson, a barber, and Elizabeth Denham, a wet-nurse. Another contemporary, Anne Finch, wrote that Behn was born in Wye in Kent, in some accounts the profile of her father fits Eaffrey Johnson. Behn was born during the buildup of the English Civil War, one version of Behns story has her travelling with Bartholomew Johnson to Surinam. He was said to die on the journey, with his wife and children spending some months in the country, during this trip Behn said she met an African slave leader, whose story formed the basis for one of her most famous works, Oroonoko. It is possible that she acted a spy in the colony, there is little verifiable evidence to confirm any one story. In Oroonoko Behn gives herself the position of narrator and her first biographer accepted the assumption that Behn was the daughter of the lieutenant general of Surinam, there is little evidence that this was the case, and none of her contemporaries acknowledge any aristocratic status. Geoffrey Chaucer, known as the Father of English literature, is widely considered the greatest English poet of the Middle Ages. He was the first poet to be buried in Poets Corner of Westminster Abbey, among his many works are The Book of the Duchess, The House of Fame, The Legend of Good Women and Troilus and Criseyde. He is best known today for The Canterbury Tales, Chaucers work was crucial in legitimizing the literary use of the Middle English vernacular at a time when the dominant literary languages in England were French and Latin. Geoffrey Chaucer was born in London sometime around 1343, though the precise date and his father and grandfather were both London vintners, several previous generations had been merchants in Ipswich. In 1324 John Chaucer, Geoffreys father, was kidnapped by an aunt in the hope of marrying the boy to her daughter in an attempt to keep property in Ipswich. The aunt was imprisoned and the fine levied suggests that the family was financially secure. In the City Hustings Roll 110,5, Ric II, dated June 1380, Geoffrey Chaucer refers to himself as me Galfridum Chaucer, filium Johannis Chaucer, Londonie. He worked as a courtier, a diplomat, and a civil servant, as well as working for the king from 1389 to 1391 as Clerk of the Kings Works. 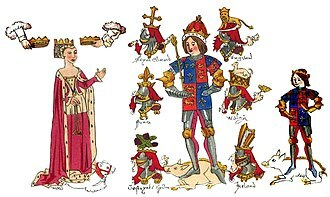 In 1359, in the stages of the Hundred Years War, Edward III invaded France and Chaucer travelled with Lionel of Antwerp, 1st Duke of Clarence, Elizabeths husband. In 1360, he was captured during the siege of Rheims, Edward paid £16 for his ransom, a considerable sum, and Chaucer was released. After this, Chaucers life is uncertain, but he seems to have travelled in France, around 1366, Chaucer married Philippa Roet. 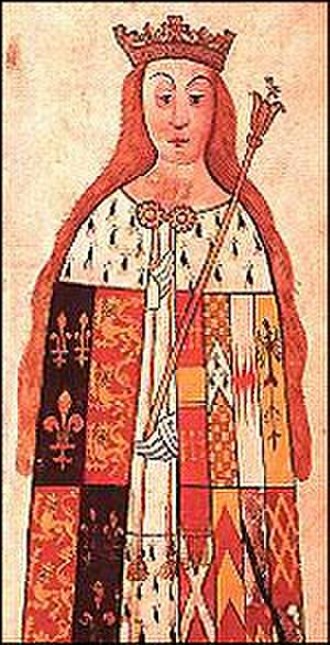 She was a lady-in-waiting to Edward IIIs queen, Philippa of Hainault, and a sister of Katherine Swynford and it is uncertain how many children Chaucer and Philippa had, but three or four are most commonly cited. His son, Thomas Chaucer, had a career, as chief butler to four kings, envoy to France. Thomass daughter, married the Duke of Suffolk, thomass great-grandson, John de la Pole, Earl of Lincoln, was the heir to the throne designated by Richard III before he was deposed. He was born and died at Owletts in Cobham, Kent. He designed the building at the Prince of Wales School in Nairobi. His tomb is in Westminster Abbey, as a boy and exploring the historical ruins found in the area were his favourite pastimes. He was profoundly influenced by the construction used in Norman cathedrals and Anglo-Saxon churches, as well as the ornamentation. This early influence is apparent in the churches and houses he designed in South Africa. He was educated at Tonbridge School, study tours of Europe were regarded as an essential part of the course. In 1891 Baker passed his examination for Associateship of the Royal Institute of British Architects and was awarded the Ashpitel Prize for being top of his class. He worked initially for Ernest George and Harold Peto in London from 1882–87, opened his own office in Gravesend, from 1902-1913 he developed his career in South Africa. In 1913 he returned to England and began practice in London in partnership with Alexander Scott, Bakers autobiography Architecture & Personalities was published in 1944. Rhodes sponsored Bakers further education in Greece and Egypt, after which he returned to South Africa and he had the patronage of Lord Milner, and was invited to the Transvaal to design and build residences for the British colonials. In 1902 Baker left his practice at the Cape in the hands of his partner and went to live in Johannesburg, Baker quickly became noted for his work, and was commissioned by a number of the Randlords to design houses, particularly in the suburbs of Parktown and Westcliff. 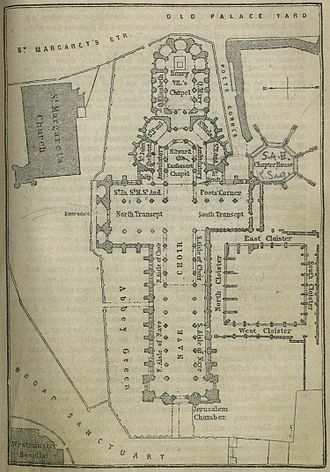 He designed commercial premises and public buildings, St Boniface Church Germiston Bishop Bavin School St. Baker used a design similar to the Greek Temple at Segesta. 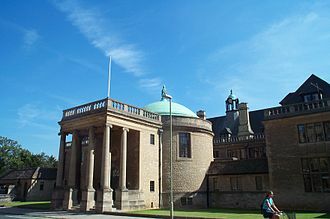 Rhodes University, Grahamstown Roedean School, Johannesburg Sandown House, property of Charles William Hutton and of John Molteno. In November 1910 the cornerstone of the Union Building was laid, hull, a member of the first Union Cabinet, chose Meintjieskop as the site for Bakers design. The site was that of a quarry and the existing excavations were used to create the amphitheatre. 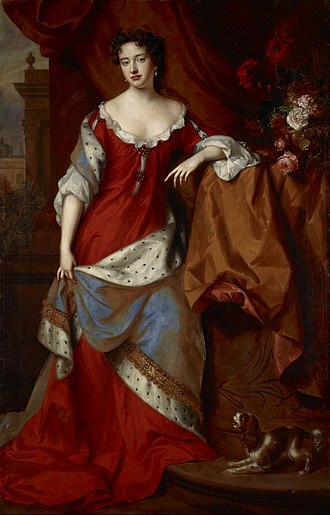 Anne became Queen of England and Ireland on 8 March 1702. On 1 May 1707, under the Acts of Union, two of her realms, the kingdoms of England and Scotland, united as a sovereign state known as Great Britain. She continued to reign as Queen of Great Britain and Ireland until her death, Anne was born in the reign of her uncle Charles II, who had no legitimate children. Her father, was first in line to the throne and his suspected Roman Catholicism was unpopular in England, and on Charless instructions Anne was raised as an Anglican. Three years after he succeeded Charles, James was deposed in the Glorious Revolution of 1688, Annes Dutch Protestant brother-in-law and cousin William III became joint monarch with his wife, Annes elder sister Mary II. Although the sisters had been close, disagreements over Annes finances and choice of acquaintances arose shortly after Marys accession and Mary had no children. After Marys death in 1694, William continued as sole monarch until he was succeeded by Anne upon his death in 1702, as queen, Anne favoured moderate Tory politicians, who were more likely to share her Anglican religious views than their opponents, the Whigs. The Whigs grew more powerful during the course of the War of the Spanish Succession and her close friendship with Sarah Churchill, Duchess of Marlborough, turned sour as the result of political differences. Anne was plagued by ill health throughout her life, from her thirties onwards, she grew increasingly lame and obese. Despite seventeen pregnancies by her husband, Prince George of Denmark, she died without any surviving children and was the last monarch of the House of Stuart. Anne was born at 11,39 p. m. on 6 February 1665 at St Jamess Palace, the child and second daughter of James, Duke of York. At her Anglican baptism in the Chapel Royal at St Jamess, her sister, was one of her godparents, along with the Duchess of Monmouth. 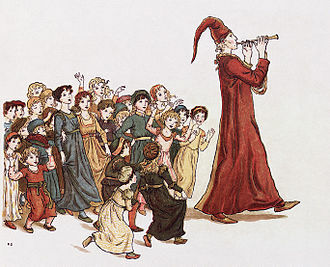 The Duke and Duchess of York had eight children, but Anne, as a child, Anne suffered from an eye condition, which manifested as excessive watering known as defluxion. For medical treatment, she was sent to France, where she lived with her grandmother, Queen Henrietta Maria. George Monck, 1st Duke of Albemarle, KG was an English soldier, politician and a key figure in effecting the Restoration of the Monarchy to King Charles II in 1660. Having assaulted the Under Sheriff of the county in revenge for a wrong done to his father, becoming a soldier, he served as a volunteer in the 1626 expedition to Cadiz, and the next year fought well at the siege of the Île de Ré. In 1629 Monck went to the Netherlands, a theatre of warfare and he fought bravely at the 1637 Siege of Breda, always first in the breach of his men. In 1638 he surrendered his commission in consequence of a quarrel with the authorities of Dordrecht. He was appointed to the lieutenant-colonelcy of the Earl of Newports regiment, during the operations on the Scottish border in the Bishops Wars he showed his skill and coolness in the dispositions by which he saved the English artillery at the Battle of Newburn. At the outbreak of the Irish rebellion Monck was appointed as colonel of Sidneys Regiment under the command of James Butler, 1st Duke of Ormonde. All the qualities for which he was noted through life — his talent for making himself indispensable, his imperturbable temper, the governorship of Dublin stood vacant, and Lord Leicester recommended Monck. Charles I overruled the appointment in favour of Lord Cavan, the Duke of Ormonde viewed him with suspicion as one of two officers who refused to take the oath to support the Royalist cause in England and sent him under guard to Bristol. Taken prisoner by the Parliamentary Northern Association Army under Lord Fairfax at the Battle of Nantwich in January 1644, during his imprisonment he wrote Observations on Military and Political Affairs. 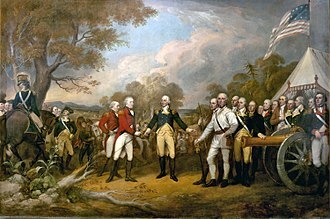 Moncks experience in Ireland led to his release and he was made major general in the army sent by Parliament against Irish rebels. Making a distinction between fighting the Irish and taking arms against the king, he accepted the offer and swore loyalty to the Parliamentary cause. He made little headway against the Irish led by Owen Roe ONeill, the convention was a military expedient to deal with a military necessity. Wilhelmina Charlotte Caroline of Brandenburg-Ansbach, commonly known as Caroline of Ansbach, was Queen of Great Britain as the wife of King George II. Her father, Margrave John Frederick of Brandenburg-Ansbach, belonged to a branch of the House of Hohenzollern and was the ruler of a small German state, the Principality of Ansbach. Caroline was orphaned at an age and moved to the enlightened court of her guardians, King Frederick I. As a young woman, Caroline was much sought-after as a bride and they had eight children, seven of whom grew to adulthood. Caroline moved permanently to Britain in 1714 when her husband became Prince of Wales, as Princess of Wales, she joined her husband in rallying political opposition to his father King George I. In 1717, her husband was expelled from court after a family row, Caroline came to be associated with Robert Walpole, an opposition politician who was a former government minister. Walpole rejoined the government in 1720, and Carolines husband and King George I reconciled publicly, over the next few years, Walpole rose to become the leading minister. Caroline succeeded as queen and electress consort in 1727, when her husband became King George II and her eldest son, became Prince of Wales. He was a focus for the opposition, like his father before him, as princess and as queen, Caroline was known for her political influence, which she exercised through and for Walpole. Her tenure included four regencies during her husbands stays in Hanover, Caroline was widely mourned following her death in 1737, not only by the public but by the King, who refused to remarry. Caroline was born on 1 March 1683 at Ansbach, the daughter of John Frederick, Margrave of Brandenburg-Ansbach and her father was the ruler of one of the smallest German states, he died of smallpox at the age of 32, when Caroline was three years old. Caroline and her full sibling, her younger brother Margrave William Frederick, left Ansbach with their mother. In 1692, Carolines widowed mother was pushed into a marriage with the Elector of Saxony. Eleonore Erdmuthe was widowed two years later, after her unfaithful husband contracted smallpox from his mistress. The Crown of Princess Blanche, perhaps made for Anne. 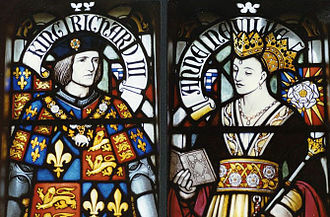 Anne and Richard's coronation in the Liber Regalis. 14th century Queen of Richard II – Anne of Bohemia – illustration by Percy Anderson for Costume Fanciful, Historical and Theatrical, 1906. 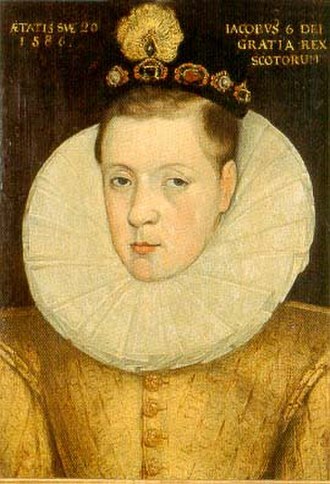 James VI in 1586, aged twenty, three years before his marriage to Anne. Falkland Palace, Fife. View of the rear of Groote Schuur, c1905. Potsdam Conference: Clement Attlee, Ernest Bevin, Vyacheslav Molotov, Joseph Stalin, William Daniel Leahy, James F. Byrnes and Harry S. Truman. Henrietta Howard, Countess of Suffolk (pictured) was one of Caroline's Women of the Bedchamber in addition to being one of Caroline's husband's mistresses. The central courtyard of Chambers' Somerset House in London. The pavement fountain was installed in the 1990s. Katherine's mother, Mary Boleyn, was the sister of Anne Boleyn and a mistress of King Henry VIII of England. 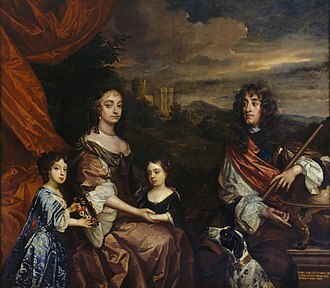 The Family of Frederick, Prince of Wales - a group portrait commissioned from George Knapton by Augusta and completed less than a year after Frederick's death. 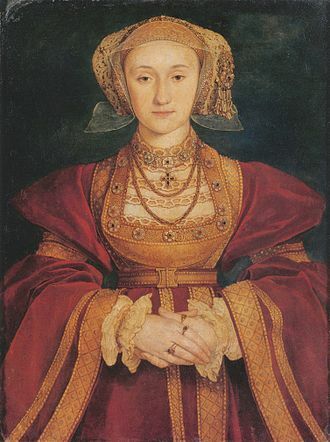 Portrait by Hans Holbein the Younger, c. 1539. Oil and Tempera on Parchment mounted on canvas, Musée du Louvre, Paris.